There are all sorts of fancy audiophile speaker stands on the market. But the basic principle just seems to be trying to hold the speaker rigid and stationary. 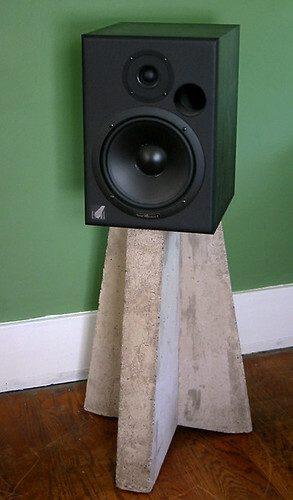 So a few years ago I thought, "I'll just make a mold, and cast a heavy concrete tripod, then screw the speakers to that." Definitely cheaper than some of the exotic metal stands. I made the mold out of melamine- (plastic) covered particle board, usually sold for making kitchen cabinets and the like. The concrete was just sackcrete from the lumberyard (which took quite a long time to cure), and I'd estimate the finished product is at least 80 lbs. each.